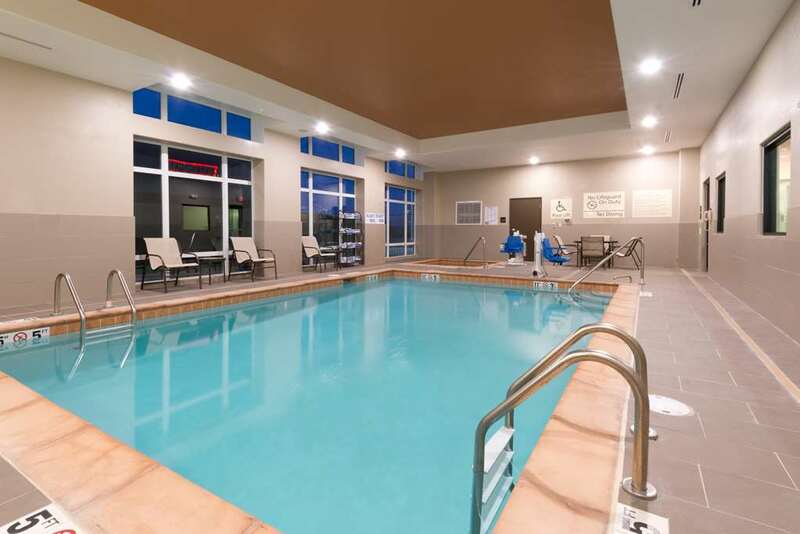 Centrally located near I-25 in Albuquerque*s North Business District the Hampton Inn - Suites Albuquerque North/I-25 is just a short walk from a variety of restaurants and Sandia Peak Tramway. Leisure options and attractions including casinos golf courses Cliffs Amusement Park and Balloon Fiesta Park and Museum are all easily reached from our modern Albuquerque hotel and the Old Town is just a short drive away. Feel at home in a bright and spacious guest room at this welcoming hotel in Albuquerque NM and enjoy amenities including free WiFi a large work area a stylish bathroom and a clean and fresh Hampton bed. Start your day with a workout in the free fitness center or a swim in the indoor pool before enjoying Hampton*s free breakfast buffet offering a variety of hot and cold favorites. If you*re heading out early grab a Hampton On the Run Breakfast Bag available free Monday through Friday for a quick healthy meal to go. Host an event at this hotel in Albuquerque with a modern meeting space and a boardroom and stay connected with the free 24-hour business center. Enjoy free tea and coffee in the relaxed lobby any time of the day or night and buy snacks and beverages in the 24-hour Suite Shop. An onsite guest laundry is available for your convenience. Friendly service clean rooms comfortable surroundings every time. If you*re not satisfied we don*t expect you to pay. That*s our commitment and your guarantee. That*s 100 Hampton. Genghis Grill: Build your own Stir Fry. Colorful Casual and Lots of Fun. Outback Steakhouse: American Casual Dining Steaks.